Growing up in Sacramento, I was aware of the history and the importance of living in a capital city; However, I was unaware of the thick art culture that has been created in this area. It was not until recently that I discovered that there is a great art community within the larger Sacramento area. To my delight there are so many galleries and art events in the area to keep this girl very happy. One of these art events includes the recent artist talk by artist Gale Hart at the Elliott Fouts Gallery in downtown Sacramento. What was meant to be an up close and personal look at her work and motivation behind it, turned out to be a very enlightening realization of the power of emotion and its affect on people. I stepped into the gallery expecting that I would hear from Gale about her art and her system of creation. When I went to leave, I felt I had a small understanding of Gale as a person and her motivations to create art and furniture as a whole. Gale is an animal lover and dedicates some of her time to help out and advocate for their needs. This could be seen in some of her installation works at the show. Gale is also a person that identifies with the power and complexity of emotions and tried to produce it into her artworks. What struck me most about Hart’s pieces was the iconography included in almost all of her works on display. In Gale’s talk, she expressed her in enjoyment in some of the original Disney characters, specifically Mickey Mouse. Being of a different generation from Gale, Mickey Mouse has different meaning for me, but we both had similar cherished memories of the famous mouse. In the piece The Power of Minnie, the female uplifting meaning entranced me. There is so much power in that one image of a powerful woman in Mickey Mouse ears (image 1). This iconography is carried throughout many of the pieces on display in the gallery and throughout many different mediums, taking in paintings on canvas, woodcut, and metal workings. Hart’s show at the Elliott Fouts Gallery will be open until October 4, 2012. Show Some Emotion is an experience that everyone should have. As a viewer you get exposure to Gale Hart’s emotions on animal rights, cherished childhood cartoon friends, and female empowerment. However, I did not just become acquainted with Gale’s emotion, but my own as well, how I related to the pieces and how I identified with the Disney iconography. As an art history student, you learn one of the greatest assets to your studies is getting the artist perspective on their creations. What is an even better resource is getting to hear from that artist for yourself. You can learn so much more from hearing their thoughts in person than on a website or a book. Getting an artists reasoning behind why they chose to paint a specific image or what meanings their collection has to them, can ultimately help form your perspective about what you are seeing in front of you. The artist talk gave me a deeper appreciation for the act of creating art and the lessons from learning about art. Getting to here from Gale Hart as a great delight and I now have a greater appreciation for art. It’s a beautiful thing. 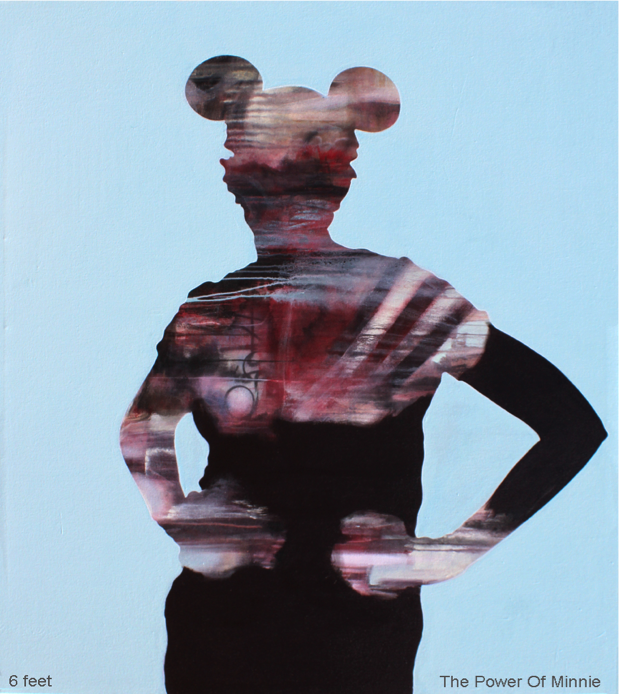 Image: Gale Hart, The Power of Minnie, 2012, http://galehart.com/Painting.html.